Their twinkling eyes looking straight within yours as they are trying to say “you, the only you, are my world”. Their waging tails shows their love towards you. These are not the only way to show their love. Actually, they share a bond of true love with you. From my childhood I was avid lover of dogs. But you know at that age we have to seek help from our parents. Typical Indian parents generally never nod acceptance for pets. Even though I used to find way to have pets. But, I dint get time with them. As you know, The middle class Indian child soon entered into war of getting job, this ruined all hobbies and same was happen to me and I too became career oriented Indian youth. One day my wife noticed a pic of very sweet dog and that was Maltese- sweetest and cutest dog. This again raises my urge to have pet and you know if your spouse have no problem then you can take anything in your home. I managed to have that. Sammy, our first canine member (we already have fishes as pets). Sammy the Maltese, adorable, elegant, lovable. She never left us alone. So we decided to have one companion for her. 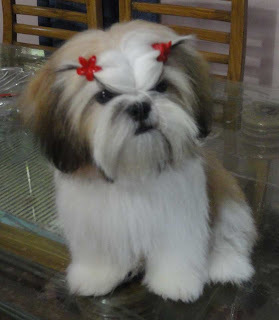 Muffin- the Shih Tzu was next one. Muffin the Shih Tzu, sweet mischievous, joyful and obedient. Her flowing fur mesmerizes all. They both are our child. We love to do their grooming, their hair styling and all other activities. Please share your feelings about Pets.